Recently I saw the Ukrainian film "The Guide" (Povodyr, 2014) by director Oles Sanin. It was this year's Ukrainian entry for the Oscars in the "Best foreign film" category. 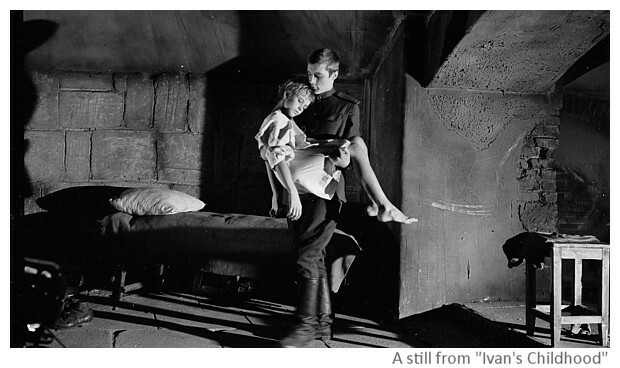 This film reminded me of another older film - "Ivan's Childhood" (Ivanovo Detstvo, 1962) by Russian director Ivan Tarkovsky. Both the films revolve around a child in hostile surroundings, running to save his life. And both the films are about nationalism - "The Guide" is about Ukrainian nationalism and "Ivan's Childhood" is about Russian nationalism. This post looks at both these films. "The Guide" is set in Ukraine in the 1920s, the period when the Soviet Union had just replaced the Russian empire. The process of creating the Soviet Union was initiated by Lenin following the Russian revolution in February 1917 and was consolidated by Stalin, following the death of Lenin in 1922. The film follows the travails of an American boy called Peter Shamrock (Anton S. Greene) as he runs away from a Russian agent Vladimir (Oleksandr Kobzar) across Ukraine. In his bag, Peter has some documents detailing Soviet plans of unleashing repression in Ukraine. The papers were hidden there by Peter's father before being killed by the Russian agents working for Vladimir. During his journey across Ukraine, Peter meets Ivan Kocherga (Stanislav Boklan), a blind Bondura (a music instrument) player. Ivan hides Peter as his nephew, using him as his guide. They are chased by Vladimir but every time, manage to elude the Russian agent. Ivan has his own reasons to hate the Russians - he was an Ukrainian resistance leader and was blinded and left for dead by Vladimir. Vladimir uses torture and killings in trying to reach Peter. He kills Orysia, Ivan's companion and lover. Finally he also manages to catch Ivan. However, Peter still eludes him. Filled with rage, Vladimir decides to kill Ivan together with all the group of blind singers. Peter follows them and tries to liberate Ivan. Exploding bombs kill Ivan and Vladimir. Peter finally manages to pass the documents about the Ukrainian repression plans to a British journalist and goes back to America. "Ivan's Childhood" follows the journey of a boy called Ivan (Nikolai Burlyayev), through the eastern front of Germany during the second world war, running away from the German soldiers. Most of the film is about Ivan's journey in a war torn landscape. He is picked up by the Russian soldiers. Ivan has lost his family to the Germans and is seeking revenge by becoming a Russian spy. Russian army admires Ivan's courage and would like to send him to school, away from the horrors of the war. However, Ivan still thinks only about his revenge from the Germans and goes back behind the enemy lines in his espionage mission. End credits tell that Ivan was discovered and killed by the Germans.. There are some obvious similarities in the themes of the two films - both are about a child running in a hostile territory to save his life. Both films are also characterized by wonderful actors. 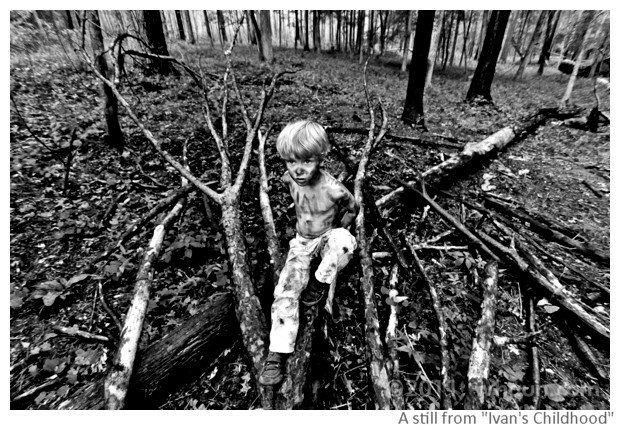 In "Ivan's Childhood", the boy is alone in his journey. This film in black and white had marvellous photography, each scene was like a painting in chiaro-scuro with stark symbols of war and destruction in the background. At the same time, the film was almost like a documentary in its austerity, both in its emotions as well as in treatment. In "The Guide", the boy has a companion, a blind singer. The film is in colour though the colours are muted. This film is also very well photographed. However, it is more melodramatic and emotional. Visually the film creates specific ambiances of 1920s Ukraine - like the rich world of music and artists in a city and the poor world of blind singers-beggars in the countryside. The film is riveting because of the thrill of the chase and escape - the evil Vladimir is never too far behind but Peter always manages to slip through his grip. The basic ideology of both the films is nationalism - In "Ivan's Childhood", Russians are the good guys, so they are kind, generous and gentle, while the Germans are the bad guys, so they are depicted in all black with nothing to redeem them. In "The Guide", Ukrainians are the good guys while the Russians are the bad guys. By posing the might of a powerful regime against the struggles of a small child, both films accentuate the good guys versus bad guys binaries. Russia is another common factor between the two films - in one film Russians are the good guys; in the other, they are the bad guys. "Ivan's Childhood" had a sub-plot about a young Russian soldier's love for a nurse and exploitation of that nurse by a Russian captain. "The Guide" has many sub-plots - Ukrainian musician Olha and her love for Michael, Peter's father, Vladimir's love for Olha, blind singer Ivan's love for Orysia, Peter's relationship with street children. Both the films can be seen as propaganda films - aiming to show the cruelty of their enemies/oppressors and the nobility of their own struggles. "Ivan's Childhood" is much more linear and blatant about it, while "The Guide" is cinematically more refined with flashbacks and a thriller-like crescendo of action that culminates in big bomb explosions. Both evoke nationalistic feelings. Both the films are worth seeing.